From the hustle and bustle of Saigon through to the beautiful natural surroundings of the Kuang Si falls, this 15 day trip through Vietnam and Laos will allow you to examine the history and culture of these two scenic Asian nations, while also providing the chance to meet the local people who will make it a visit to remember. Arrive in Ho Chi Minh where you will meet your guide before being transferred to your hotel to check in. The remainder of the day is yours at leisure to ready yourself for the adventure ahead. Leave early in the morning to head for the Cu Chi District, passing through small villages where locals are busy going about their business to give you an insight into everyday Vietnamese life. On arrival at the Cu Chi tunnels, you’ll take a tour around some of the network created by the Viet Cong for use during battle in both the French and American Wars, gaining an insight into what it was like to be a guerrilla fighter. 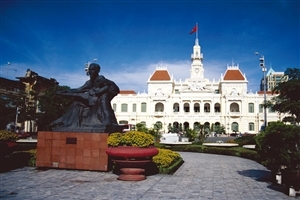 On return to Ho Chi Minh, your tour will take in a number of the main sights, including the Presidential Palace, Old Saigon Post Office, Opera House and City Hall. Take an early morning drive to the delta town of Cai Be, where you will board a boat for a trip around the floating market. Here, you’ll be able to see the local traders at work; hanging their produce from long poles on the front of their boats in the hope of attracting a sale from people passing by. After time at the market, you’ll visit a local cottage factory to see local goods – including rice paper and coconut candies - being produced, before the chance to enjoy the scenery as you cruise along the water to Dong Hoa Hiep Island. Once there, you’ll enjoy a Mekong style lunch featuring a number of local specialities and there is the option of a trip on a sampan before returning to Ho Chi Minh. Following breakfast, you’ll head for the airport to take a flight north to Hue, where you will then meet your guide before dropping your luggage at your accommodation. A tour of the sights then starts with a visit to the Imperial Citadel walled fortress built by the Nguyen dynasty before you head for the banks of the Perfume River to marvel at the iconic Thien Mu Pagoda which, at 21 metres high, is the tallest in the country. Your tour will end with a visit to the Mausoleum of Tu Duc, which served as a palace retreat before becoming the Emperor’s final resting place. Enjoy a scenic trip down the coast from Hue to the ancient trading port of Hoi An, passing through the picturesque fishing village of Lang Co en-route. You’ll also travel across the famous Hai Van Pass, which is also known as the Ocean Cloud Pass because of the mists that rise from the sea and reduce visibility for motorists tackling the challenging road. Having arrived in Hoi An, you’ll enjoy a walking tour around the ancient town centre to visit former merchants’ houses, the famed Japanese covered bridge and the town’s colourful market. A day at leisure to explore some of the sights around Hoi An, such as the numerous museums that tell the history of the town and the surrounding region. You could also book onto one of the various boat excursions that head out from Hoi An to explore the river and coast nearby (own cost) or you could simply take a stroll through the narrow Hoi An streets before relaxing on the beach. 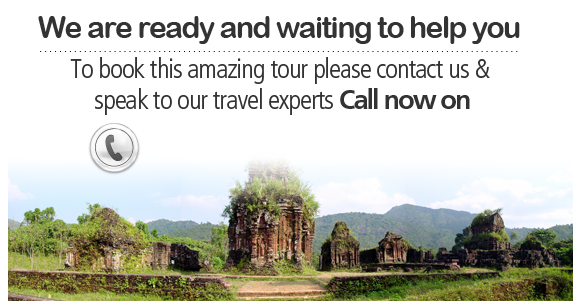 Depart Hoi An and head for the airport in Da Nang, where you will take a flight to Hanoi in the north of the city. Meeting with your guide on arrival, you’ll continue onwards to Halong City for a night in the coastal resort. Following breakfast in the hotel, you’ll head for the pier to board a traditional day junk boat for a cruise around the emerald green waters to be found in Halong Bay. 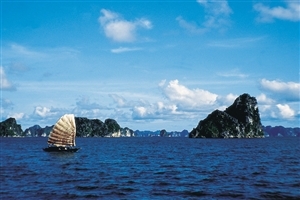 Sail around the thousands of spectacular limestone islands that litter the bay and enjoy lunch on the water before returning to the pier and travelling back to Hanoi. On arrival in the city, you’ll get to experience a unique Water Puppet show depicting scene from rural life in the country. Spend a full day exploring the sights of Hanoi on a city tour, starting with the chance to visit the mausoleum of Ho Chi Minh; the father of modern Vietnam. 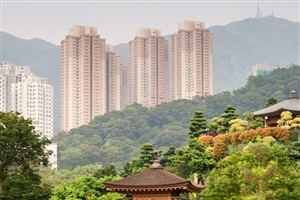 From there, you’ll take the short trip to the wooden house that was his temporary home in later life and also admire the stunning One Pillar Pagoda, an impressive Buddhist temple regarded as one of the most iconic to be found anywhere in the country. The Temple of Literature university and the temples at Tran Quoc and Quan Thanh also feature on the tour, as does the Hoa Lo Prison, where American Prisoners of War – who dubbed it the ‘Hanoi Hilton’- were held during the Vietnam war. The tour comes to an end with the visit to the Old Quarter of the city to explore the bustling network of narrow streets that are home to thousands of small shops and businesses. Leaving your hotel in late morning, head for the airport to take the flight out of Vietnam to the Lao capital Vientiane – a quiet city that is a world away from the hustle and bustle to be found elsewhere in the Asian region. After the transfer to your hotel, you’ll have the afternoon at leisure to simply relax at your resort or to head out and explore some of the sights. You could elect to visit the local markets or take a stroll along the banks of the Mekong River to watch the sun go down. Welcome drinks with your fellow travellers and your tour guide is the perfect way to end the day. Spend a full day exploring the many delights to be found around Vientiane, starting with a trip to the ancient Wat Si Saket; the oldest temple still standing in the city and one of the most beautiful to be found anywhere in Laos. After a trip to the museum within the former temple at Haw Phra Kaew, you’ll have the chance to admire the Presidential Palace before taking in stunning views of the city from the Patuxai Monument, which bears a striking resemblance to the famous Arc de Triomphe. Following a visit to the holy site of That Luang you’ll head out of town to visit the textile shop at Mai Savanh. On your return to Vientiane, you’ll discover more on the impact of conflict on the people of Laos with a visit to COPE; an association that works to help victims of landmines. After some free time in the morning, head for the airport to take a flight to Luang Prabang, where a guide will be waiting to help transfer you to your hotel. Once checked in, the afternoon is set aside for a short walking tour to visit the impressive temples at Wat Xieng Thong and Wat Mai. 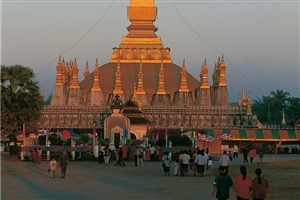 You’ll also be able to speak with a local monk to learn more about the beliefs and faith of the Buddhist people. You’ll start the day with a tour of more of the city sights, with the first stop being the National Museum where you can uncover more about the history of Laos, with more to learn when you then move on to the Traditional Arts & Ethnology Centre. In the late morning, you’ll head for the banks of the Mekong River to join a relaxing cruise upstream to the famous Pak Ou Caves where you can admire the huge array of Buddha statues that have become a major attraction for visiting pilgrims. On the return cruise, you’ll be able to see how traditional rice wine is created at the village of Bang Xang Hay. After transfer back to the hotel by tuk-tuk, the remainder of the day will be yours to spend at leisure. Take a trip out of Luang Prabang as you make the short journey to Kuang Si for a visit to the beautiful waterfalls. En-route, there will be chance to stop at one of the largest markets in the area, and also at a local village to learn about the traditions and cultures of some of the ethnic minorities who call the region their home. On arrival in Kuang Si, you’ll be able to take a dip in the turquoise blue pools that surround the falls, enjoy a climb to the summit to admire the views or take a walk through the dense woods that are to be found lining the water. There is also the opportunity to visit Kuang Si’s bear sanctuary, where you can see the Asiatic Black Bears that have been saved from poachers by the Free The Bears Fund. After your breakfast, enjoy some final free time at leisure before heading for the airport and your return flight home.